China has welcomed foreign fund managers to play in the hottest corner of its volatile equity markets. Unfortunately the government’s rhetorical support for “indigenous innovation” led to overheated share prices. That and other market distortions should warn off the cautious investor. The launch of the Shenzhen-Hong Kong Stock Connect on Dec. 5 will allow foreigners to buy shares in China’s top names in biotech, robotics and online services. Many predict the link to China’s southern tech hub will attract more trading than the current Shanghai-Hong Kong trading link, since the Shanghai bourse represents the “old economy” of state-owned giants. There will probably be a quick surge when the doors open, driven in part by foreign institutions porting Shenzhen stock holdings out of their Qualified Foreign Institutional Investor (QFII) portfolios into Connect accounts, freeing up quota for bonds. Hedge funds could jump in, looking to profit from volatility itself. The move may also persuade index provider MSCI to include Chinese shares in its emerging markets benchmark, luring an estimated $400 billion in passive funds. But the case for a sustained influx looks weak. The sliding yuan is a deterrent, as is the lack of credible analyst coverage of many Shenzhen firms. China’s revival in 2016 was largely driven by old-school industrial companies, and domestic investor confidence in Beijing’s ability to support innovation has waned, deflating valuations. For example, China’s goal of creating domestic robotics champions was seen benefiting companies like Shenzhen-listed Siasun Robotics, one of the country’s oldest industrial automators. But the policy instead spurred an acquisition spree, culminating in home appliance maker Midea buying Germany’s Kuka. Siasun stock is down around 35 percent in the last year. The wider ChiNext growth board – sometimes called “China’s Nasdaq” – has fallen around 15 percent in the last 12 months, underperforming the CSI300 blue chip index by 7 percentage points. That still doesn’t make Shenzhen cheap. 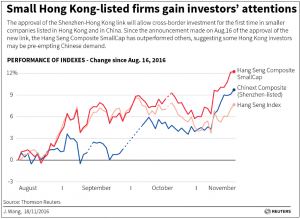 The ChiNext trades at 58 times earnings, compared to 11 for the Hang Seng Composite Smallcap Index in Hong Kong. Shenzhen companies may be good but they aren’t that good. 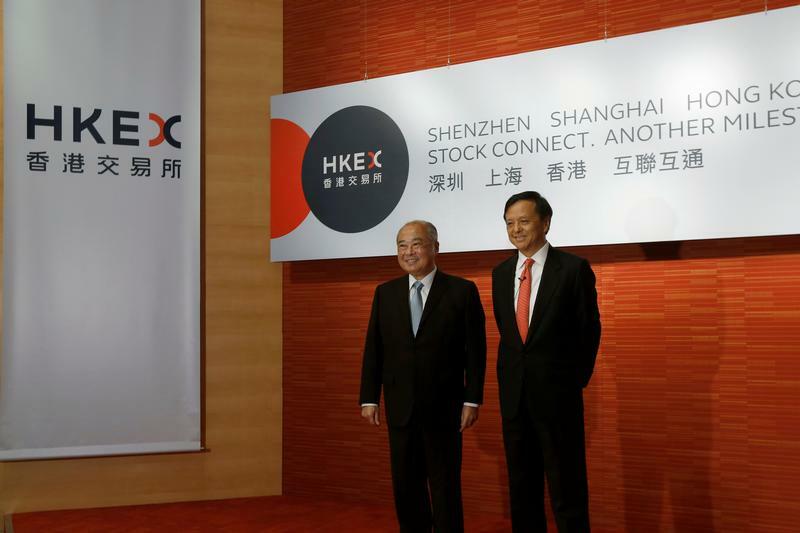 Shenzhen-HK stock link tees up "Bubble Connect"
A stock trading link between the Hong Kong and Shenzhen exchanges will go live on Dec. 5 following the satisfactory conclusion of testing, regulators said on Nov. 25. It will model the existing Shanghai-Hong Kong Stock Connect programme, launched in 2014, which allows qualified investors active on each stock market to buy and sell selected shares listed on the other bourse. Foreign investors will be allowed to trade shares in constituents of the Shenzhen Component Index and the Shenzhen Small/Mid Cap Innovation index provided that the companies have a market capitalisation of at least 6 billion yuan ($867 million). Chinese investors will be allowed to invest in constituents of the Hang Seng Small Cap Index with a market capitalization of at least HK$5 billion ($645 million), as well as companies with dual listings in both markets. The overall limits for shares held through the Shanghai Connect have been abolished, and Shenzhen Connect will likewise have no aggregate quota. Daily flow quotas will be 13 billion yuan from Hong Kong into Shenzhen and 10.5 billion yuan from Shenzhen into Hong Kong. Hong Kong Exchanges and Clearing said it plans eventually to include exchange-traded funds as eligible securities.